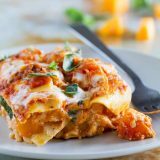 One skillet is all you need for this easy Skillet Butternut Squash Lasagna. Easy enough for a weeknight, and all you need is one pan! Place the butternut squash on a baking sheet and drizzle with the olive oil. Sprinkle with salt and pepper and stir to combine. Spread the squash into a single layer, then roast until the squash is fork-tender, 25-30 minutes, stirring once or twice during baking time. Remove from oven and let cool slightly. In a medium bowl, combine the squash, ricotta, 3/4 cup of the Parmesan, the rosemary and the nutmeg. In another bowl, combine the marinara with the basil. Spread 1/2 cup of the marinara in the bottom of a large nonstick skillet. (Mine is a 12-inch skillet.) Cover the marinara with 2 of the lasagna noodles. Spread half of the butternut squash mixture on the noodles, then sprinkle 1/3 of the mozzarella over the top. Add another layer of noodles, the rest of the butternut squash mixture, 1 cup of the marinara, and half of the remaining mozzarella. Top with the remaining noodles, the rest of the marinara, then the remaining mozzarella. Sprinkle the remaining 1/4 cup of Parmesan over the top. Let the lasagna sit for 5 minutes before serving.